Terrible situations deplete of us hope. It’s easy to lose hope when faced with hardship, broken relationships, illness or a crisis. Or perhaps we’ve been waiting for something to happen – a relationship restored, a loved one to be healed, a wayward child to come home – and it’s been a long, long wait. But what if we can find hope in the midst of and as a result of those broken places? That’s what author, Deborah Malone, writes about on her blog and in her new book, Blooming in Broken Places. Deborah is no stranger to the trials of life. She takes us on her real-life journey beginning with being her mother’s caregiver, to the rocky time of caring for her severely disabled daughter and finally to the disappointment and trials of an abusive marriage that left her broken and feeling worthless. But Deborah’s journey doesn’t stop there. Through healing and a gradual realization of God’s unlimited love, Deborah discovered how He could use her despite her limitations. In her book, Deborah delves into how numerous women from the Bible were all used by God, even while they were in broken places. I recently had the privilege of interviewing Deborah. It was great to get to know her a little better. Definitely tea. However, I do love my one cup of flavored coffee in the morning with a dollop of whipped cream on top. I have two places I like to write. If I’m not on a deadline then I will write in the family room sitting on the couch with my laptop. If I’m on a deadline then I will write in the office, at the desk, where it is quiet and I can concentrate. I think people don’t realize the time that goes into writing a book. How long did it take you to write Blooming in Broken Places? In what ways did you find it healing? Love this question. This book is so dear to my heart. Many have asked me to write my story for many years. I wasn’t in the right place at the time. I didn’t want it to be negative or depressing, and I didn’t want to breathe life into long buried feelings. I was asked to speak on my life to a group of women who needed some encouragement. So many came up afterwards and told me I should write about my life to share with other women. I didn’t write it then, but it sparked a flame in me. While I was writing my third book in the Skye Southerland Cozy Mystery Series, I was led to write Blooming in Broken Places. I came up with the idea of weaving my story between twelve women from the Bible that were broken, but whom God used in a mighty way even in their darkest times. In this way it would encourage those who read it. It took a year from conception to publication. I am not going to say it was easy. After my first draft my editor and publisher both said I needed more me in the story. I knew then I could not get away with writing the bare bones. I would have to dig up feelings long buried for the story to be authentic enough to touch others. I never realized in the writing process I would find the healing I had been longing for. From the reviews of your book, I would say people really appreciated the “you” factor. Well done delving into those difficult areas. If you had to pick one women from the Bible that you wrote about, who would be your favorite? Why? Oh my goodness. You would have to ask this question. During my research and writing I fell in love with all the women and came to admire their tenacity and faith. I call them my posse now. But, if you insist, I would have to pick the Samaritan Woman at the well as my favorite. It is such a beautiful story. Jesus went out of his way to put himself in her path. He had a plan for her life – and he didn’t wait until she was perfect to use her in a mighty way. This tells me I don’t have to be perfect for God to use me, too. She’s my favorite too! She even ended up being one of the secondary characters in my new book, Rachel’s Son. I love the way Jesus interacted with her. So what’s the most important message you want your readers to get from your new book? We are all broken in some way. God can and will use us mightily even in our darkest moments. Also, if our goals haven’t been met yet it doesn’t mean they won’t happen. God’s timing isn’t always our timing. I was 57 when my first book was published. Hope you don’t mind a final personal question. When you’re not writing, what do you like to do? Well, I guess it would be walking on trails in the woods. It’s a great way to get outside and get some fresh air. I’m looking forward to warmer weather. I still enjoy reading, but I don’t have a lot of time to read. If you’re like most of us, in need of hope, you can find Deborah’s new book on Amazon. Visit her blog and let her know you read this article. Deborah is also the author of mystery novels set in Georgia. Deborah Malone’s first novel Death in Dahlonega, finaled in the American Christian Fiction Writer’s Category Five writing contest. Deborah was also nominated for 2012 and 2013 Georgia Author of the Year in Novel category. She has worked as a freelance writer and photographer for the historic magazine, Georgia Backroads, since 2001. She has had many article and photographs published, and her writing is featured in Tales of the Rails, edited by Olin Jackson, as well as the “Christian Communicator” and “Southern Writer’s Magazine.” She is a member of the Georgia Writer’s Association, Advanced Writer’s and Speaker’s Association and the American Christian Fiction Writers. I loved this short interview! Thank you for posting it. I have been meditating on a concept the Lord gave me recently, “He doesn’t focus on our sin, but our send.” Reading this post and seeing how she became her mom’s caregiver etc, I was reminded of the evening when I came to Christ, I was full of immorality but God didn’t focus on my sin. Instead, He gave me the promise that I would be going to France to do His work. He spoke a promise (send) into my life. One year later, a good friend asked me if I would be interested in inviting a young man to our churches singles retreat. I said sure but Jeff was a quadriplegic. So, I met Jeff and he and I went to the singles retreat and I was his caretaker for that weekend. Very humbling and he and I became great buddies. God uses these situations to make us better people and to prepare us for our purpose (send) and not focus on the sin. That retreat was the second one I had attended. Before I knew of Jeff, I was so excited about going because there were many pretty girls in our group. But with Jeff, there was no time for mingling with the girls. Besides, God was preparing me for Janie and boy was I a lot of work. This article reminded me of this time in my life with Jeff and how I can see how God uses situations and people to bring life to us in the midst of our broken places. He focuses on our send, not our sin. There are examples throughout Scripture how God gives sinful, broken people purpose and promise. Peter said to Jesus, “Depart from me for I am a sinful man.” Jesus replied, “Follow me and I will make you a fisher of men.” Love that! Or the demoniac. Jesus heals him and SENDS him to go and share the wonderful news. I love this, Ken! Thanks so much for sharing. It helps remind me of how God heals and grows us in the process of living. He doesn’t wait until we’re healed and then sends us. Great reminder! That was beautifully said. Thank you for sharing! 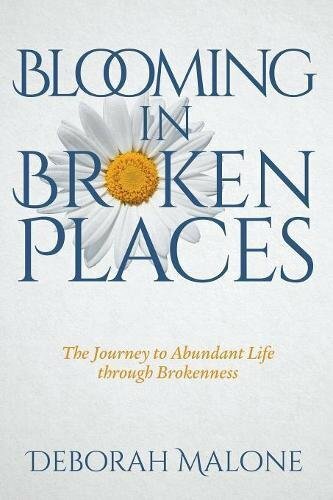 I enjoyed learning more about Deborah and her book, Blooming in Broken Places. Great title and book cover too. I love that Deborah wants to encourage others. Yes! We were critique partners years ago for a brief stint. I look forward to reading her books!